What’s the Difference Between the Mitsubishi Outlander and the Outlander Sport? With two oh-so-similar nameplates, the Mitsubishi Outlander and the Outlander Sport are often lumped together. Some assume they’re the same model, but the Outlander Sport is a higher trim, but that’s simply not the case. There are a handful of differences between the Outlander and the Outlander Sport, starting with their sizes. The Mitsubishi Outlander is a large, three-row SUV that seats up to seven passengers. The Mitsubishi Outlander Sport is a significantly smaller SUV, with only two rows and seating for five passengers. They have similar exterior appearances, despite the Outlander’s longer frame, but the interior space is one drastic difference. The Outlander and the Outlander Sport each come with their own distinct powertrains, as well. The standard 2018 Outlander is equipped with a 2.4-liter inline four-cylinder engine rated at 166 horsepower and 162 lb-ft of torque. Ironically, considering its name, the Outlander Sport’s standard engine is a smaller 148-horsepower 2.0-liter four-cylinder. 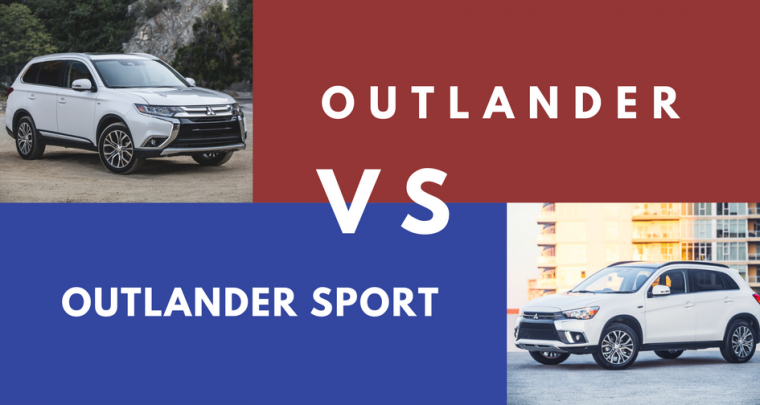 When it comes to technology, the Outlander and the Outlander Sport are fairly comparable. Both models come with 7-inch touch panel display audio systems, but the Outlander comes with two additional speakers to accommodate its third row. Android Auto, Apple CarPlay, and SiriusXM Satellite Radio are available on both models, as well. Safety features are pretty similar across both Mitsubishis as well, with standard features like Hill Start Assist (HSA), Active Stability Control (ASC), a LATCH child restraint system, and seven air bags. The SEL trims of both models — which is the range-topping trim for the Outlander Sport — come with driver-assist options like Blind Spot Warning Systems and Adaptive Cruise Control. There are some underlying similarities between the Mitsubishi Outlander and the Outlander Sport, primarily because they are both Mitsubishi SUVs. However, when it comes down to the functionality and body-style, they are two very different vehicles.